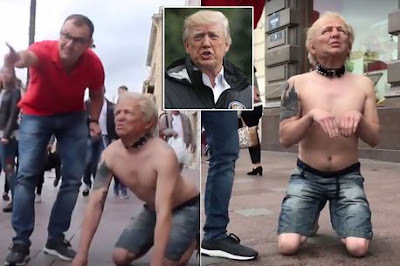 A bizarre video showing a semi-naked Donald Trump look-a-like being 'walked' around on a dog lead has been banned from YouTube . 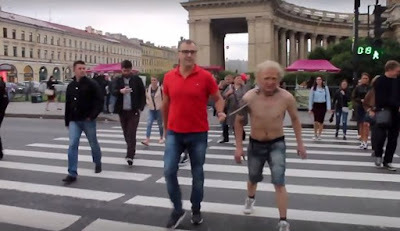 The footage - published in local media - shows oligarch Aleksandr Donskoy parading the Trump-style 'dog' around the city in St Petersburg. car where he barks at people through the window. Donskoy - who dubbed his stunt 'Trump, Heel!' - said: "The politician, who has given people great hope - not only in my country, but also the majority of Russians, Americans and residents of many other countries - was not able to keep his promises and follow his principles." Donskoy - once the he Mayor of the northern Russian city Arkhangelsk - is known in Russia for his weird video stunts.